As mentioned in my last post, I am currently in the process of familiarising myself with the new Reidbury Kitchen. I had unpacked all my kitchen stuff on the first day, but remembering where I’ve put everything is quite a different matter! But I have to say, it’s all starting to feel like more normal now and, as my boyfriend stated the other day, the newly located Reidbury Kitchen is knocking out a few classics! That comment came off the back of this recipe I tried from the latest Olive Magazine (subscribe here – it really is worth it)!. It’s another of those recipes that doesn’t sound that interesting, but it is somehow far greater than the sum of its parts. I find skinless chicken breasts can be quite bland and boring as far as meat goes, but the marinating time really improves the texture and flavour of the chicken. But I’d say it’s the sauce that really pulls this whole meal together – zingy, fresh and works really well with the panko-crusted chicken. The recipe below doesn’t really talk about a carby serving suggestion, just the chicken with some baby gem lettuce and a dollop of mayo. Erm, no. That’s not how I roll. So I added some buttered new potatoes and I’m glad I did! Given how nice this dish was, and that it was pretty simple to make, I reckon this might be one that becomes part of my permanent repertoire. Put the chicken breasts between two pieces of baking parchment or cling film and, using a rolling pin, batter the crap out of them so they’re flattened to approx 1cm in thickness. Put in a ziplock bag and add the rosemary, buttermilk, 2 tbsp lemon juice and the bruised garlic cloves. Season well, make sure the chicken is coated in the buttermilk mixture and leave for at least 2 hours or overnight in the fridge. Remove the chicken from the marinade and shake off any excess before coating in the breadcrumbs. Heat 0.5cm oil in a frying pan over a medium-high heat and fry the chicken for 6-8 minutes until golden and cooked through, turning once. Remove and put on kitchen towel, sprinkle with a little salt and keep warm. Clean out the pan and then add another tablespoon of oil. Add the shallot and chopped garlic to the pan and fry until golden. Add the stock and simmer until reduced by half. Stir through the remaining lemon juice with the zest, parsley and capers. Finish the sauce by adding the butter and swirl in. 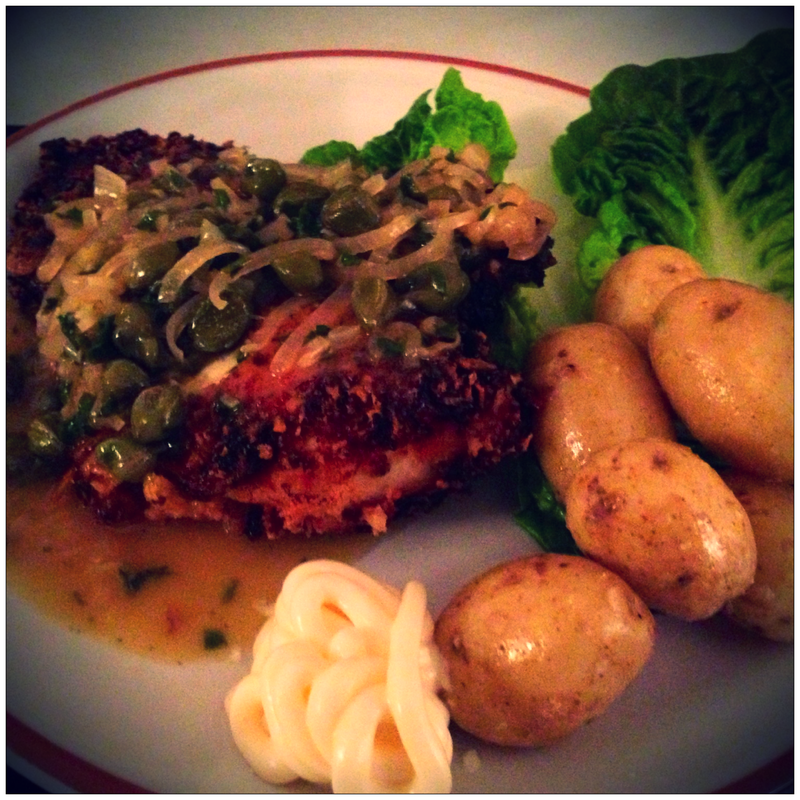 Season and serve the chicken with the piccata sauce, gem lettuce leaves and a dollop of mayo. Oh, and the potatoes if you’re following my advice! Categories: Chicken, Reidbury Recipes | Tags: Chicken, lemon, Olive February 2014, spring, summer | Permalink. It’s been a while since my last post, and I actually have a very good reason. Reidbury Kitchen has officially relocated! We have finally bought our first house and have spent the last few months preparing to move, actually moving and then trying to make it a home (this place needs work)! But I know that it’s definitely home now as, yesterday, I decided to bake! I’ve popped the new Reidbury Kitchen’s cherry, so to speak. This kitchen is small (the master plan is to eventually convert the garage into a shiny, new kitchen), so I thought it might be a challenge. However it is soooo much bigger than the kitchen I’ve left, and it even has a door. A DOOR! It’s not part of the lounge! Meaning that I can enjoy listening to my own music, and Paul doesn’t have to turn the TV up every time I boil the kettle or use the food processor. Perfection! Anyway, onto the recipe. I’ve decided to laugh in the face of the January health kick. Sod detoxing – I’m retoxing. And as soon as I saw this recipe for Salted Caramel Shortbread in the latest edition of Olive Magazine I knew we had a strong contender. I’ve never made shortbread so I was interested to see how it would play out, but I reckon this has to be one of the easiest things I’ve ever made and definitely the tastiest! The salted caramel that runs through the centre of these shortbreads really cuts through the sweetness, so don’t shy away from a good sprinkling of sea salt at the caramel-making stage. It will balance out nicely. Finally, tracking down rice flour might be a challenge. Having checked all probable aisles in Waitrose (ooh, fancy), I still couldn’t find it. Turned out it is kept in the gluten free section – thought I’d share the knowledge. You owe it to yourself to give these a try. They really are delightful! To make the caramel, heat the sugar in an even layer in a frying pan until it melts and then starts to bubble golden brown. Swirl the pan if you need to keep the melting and browning even (it’s worth taking this off the heat earlier than you think as it can go from golden to dark brown very quickly. And dark brown is pretty much burnt). Add a good sized pinch of salt flakes and tip the caramel onto an oiled baking sheet set on a wooden board. Cool and then break into chips with a rolling pin. Whizz the butter and sugar in a food processor until you have a smooth paste. Add all the flours and a pinch of salt and whizz to form a dough. Tip onto a lightly floured surface, pat out gently and sprinkle with the caramel chips. Fold in half and then transfer to a 20cm x 30cm (or similar) tin and push into an even layer. Cover and chill for 30 minutes. Heat the oven to 180C/Fan 160C/Gas 4. Bake the shortbread for 25-30 minutes or until golden brown and cooked through. Cool in the tin for 5 minutes, mark into fingers with a knife (you should get about 20 decent sized pieces) and then cool completely. Cut along the marked lines into pieces. Heat the chocolate in a bowl set over (but not touching) a pan of water or microwave until it starts to melt, stir until smooth and take it off the heat. 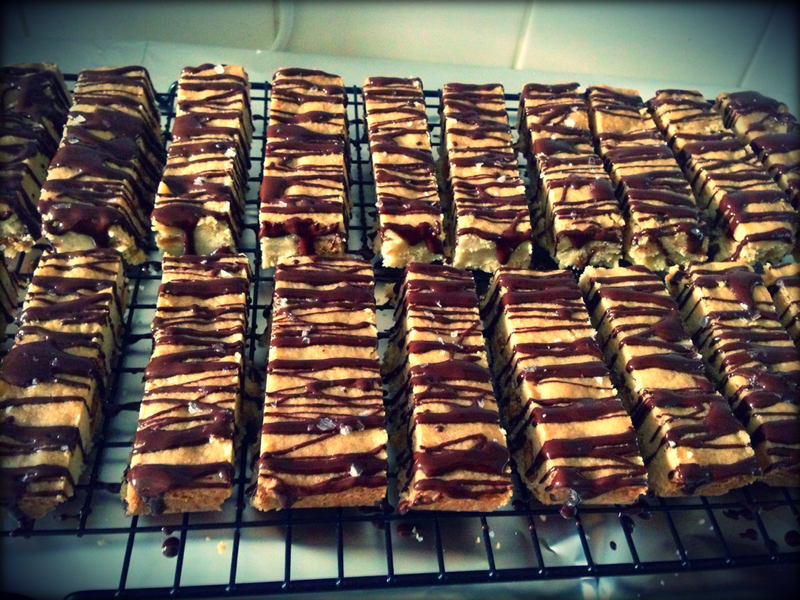 Lay the shortbreads next to each other with a tiny gap between them on a cooling rack and spoon over the chocolate in strips. While the chocolate is still wet, sprinkle with some salt flakes and then leave to set. Categories: Cakes & Baking, Reidbury Recipes | Tags: Baking, Cake, caramel, chocolate, Olive February 2014, traybake, treat | Permalink.